Pure fire in motion. That is how Cecil’s peers describe his performances. 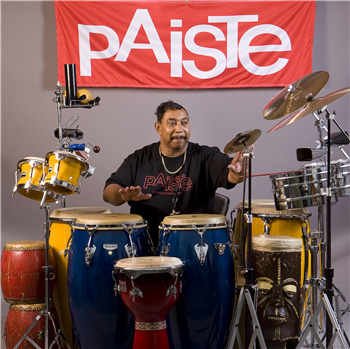 Cecil Washington (aka Cecilio Valdez Washington) is an internationally known percussionist who has been performing with a multitude of world renowned musicians. Cecilio “Valdez” Washington started playing bongos at an early age. By the age of 10, he had performed at public theaters, football games and churches. He attended the George Westinghouse High School in Pittsburgh, PA, where he performed in drama productions, concerts and band events. He is a self-taught percussionist (bongos, congas and timbales) with an extraordinary ear for timing. Cecil has performed with/or opened for the elite for the new millennium along with living legends such as Andy Madadian (aka ANDY – Prince of Persian Music) Pamela Williams, Larry Coryell, Alabama, Rusted Roots, Mimi Fox, Barbara Eden, Monty Alexander, Jimmy McGriff, Modern Jazz Quartet, Michael Brecker, Benny Golson, (wrote “Killer Joe” and recently starred in Steve Spielberg’s movie, “The Terminal” starring Tom Hanks), Rufus Reid, Jimmy Ponder, John Alexander, Kenny Blake, Roy Ayers, Peaches & Herb, Nancy Wilson, Jon Faddis, Marcels, Slide Hampton, James Moody, Modern Jazz Quartet, Stanley Turrentine, Steve Lawrence & Edie Gorme, Eddie Harris, Geri Allen, Zakir Hussain, Herbie Mann, Herbie Hancock, Jim Rupp, Melvin Lewis, Jerry Lewis, Andy Williams, Nat Adderly (Cannonball Adderly’s brother), Dakota Stanton, The Lettermen, Donald Byrd, Bob Mintzer, Andy Gonzalez, David Valentin, Eddie “Gua Gua” Rivera, Flora Purim & Airto Moreira, Greg Abate, Othello Molineaux, to name a few. He was billed with music giants such as Mary J Blige, Lou Rawls, Rick James, Dizzie Gillespie, Tony Bennett, Bobby McFerron, George Benson, Sarah Vaughn, Bobbie Short, Tower of Power, Neville Brothers, Giovanni Hidalgo, David Sanchez, Chucho Valdez, Adela Dalto, Christian McBride, Toots Thieleman, Steve Reid, Los Hombres Calientes, Bill Summers, Kevin Eubanks, Tito Puente, Terence Blanchard, Cassandra Wilson, to name a few. Cecil continues to perform on television shows and radio stations and has done extensive work in recording studios throughout the tri-state area. He performed with drummers Baba David Coleman, Chief Bey, Eli Kihonia & Willie Anku at various dance and drum classes. Also served as percussionist for Martha Miller Dancers, Pittsburgh Ballet, YMCA, and Columbus BalletMet, to name a few. For over five years Cecil performed at various country clubs with the Mike Carney Orchestra (son of the late Art Carney, Jackie Gleason’s neighbor in “The Honeymooners”). Cecil performed with George Gee and the Make Believe Ballroom Band in the made-for-TV movie called “Stuck with Each Other”, starring Tyne Daley. He also performed at the Blue Note and Apollo Theater in New York with the George Gee Band, featuring singer Sandy Dowe. Since the 1980’s until present, Cecil has performed with Dr. Nathan Davis (the music professor at University of Pittsburgh, PA ). He toured overseas in Guadeloupe and at the Middleheim Jazz Festival in Antwerp, Belgium with Dr. Nathan Davis & Tomorrow. From September 1998 until April 2004 Cecil toured with the internationally known latin-jazz group, Afro-Rican Ensemble. Presently Cecil performs as a sideman for various groups in the tri-state area.